The ILARCO manufactured American 180 was available in a twin gun configuration. 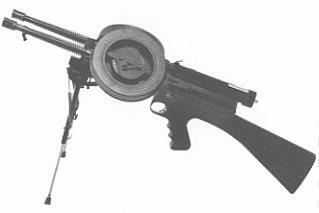 Two receivers were mounted on a single stock. Weighing over fourteen pounds, it must have been awkward to use. However, at 3000+ rounds per minute, it had tremendous firepower.